"Laurene Marie Jewett, Westbrook College, Class of 1976"
Westbrook College student Laurene Marie Jewett, Class of 1976, was a Legal Secretary major and lived in Linnell Hall. For her senior class candid photo, which appeared in the 1976 Tower Yearbook, she wore a pale colored pantsuit and large, round earrings. Her hair was long, parted in the middle and partially pulled back. 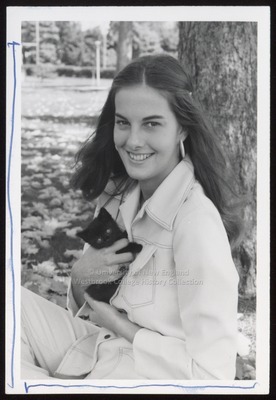 Laurie sits on the Campus Green at the base of a tree and holds a small black kitten in both hands, against her chest.